Light Green 4 inch wide, strap-like leaves, 20-24 inches in length. Dense, spherical, 4 inch diameter, umbel of Purple-Lilac flowers in May-July , followed by seeds ripening in August. 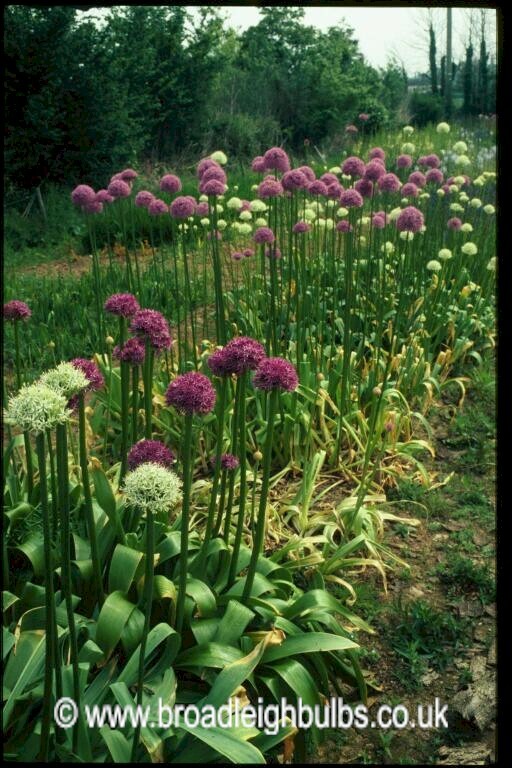 Edible Allium aflatunense is native to central China and is an excellent cut flower. Flowers when all the tulips are gone. Allium x hollandicum from R.V. Roger has "Lilac-blue flowers carried on strong 90cm (35") stems. A good reliable variety for anyone who is starting out with alliums." "Allium hollandicum is hardy throughout the UK but in higher rainfall areas it would be better planted in well drained situations and certainly positioned to get the sun in the late spring and early summer. They can be planted in swarms where the slight variation in size, colour, maturity and height of this form adds to their charm. Grow them where the foliage of other plants camouflages the leaves as they wither (at about flowering time). The pale greens of plants such as Alchemilla, the purples of the hardy herbaceous geraniums or the blues in the late Camassia all compliment their purple colours very well. Allium hollandicum bulbs should be planted 3-4" (7.5-10 cm) deep in a sunny situation, and in better drained soils. Allow 6" (15 cm) between the bulbs and plant in loose groups without regimentation." from Avon Bulbs. The growing plant is said to repel insects and moles.